As part of the changes to the Rules of Golf, amateurs are now eligible for big prizes for a hole-in one. Changes to the Rules of Golf announced late year included the news that amateur golfers can now play for unlimited hole-in-one prizes. Rule 3-2b now states that: “An amateur golfer may accept a prize in excess of the limit in Rule 3-2a, including a cash prize, for a hole-in-one made while playing a round of golf.”, and the limit in Rule 3-2a is $750. With this in mind, the guys at Hole-in-One Golf are offering up a pretty decent prize to Australian golfers if they strike a hole-in-one during a club competition, $10,000 to be exact. Like any competition though you need to be in it to win it and you need to sign-up beforehand – then if you make a hole-in-one, you’re in the money. A hole-in-one is one of the highlights of every amateur golfer’s career. A nice little cheque to go along with it would be pretty sweet indeed. 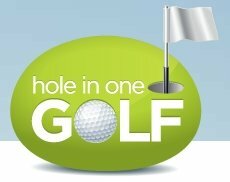 Hole-In-One Golf are offering $40 off to the first 250 that sign up to a Gold Plan. All you have to do is mention ‘Aussie Golfer’. Check out their website for more details.